As she approaches the grand old age of two, M is becoming increasingly aware of her clothing. In fact, she is rapidly becoming a fashionista and her latest habit is to announce her attire to any room we enter (slightly embarrassing when we’re late to Bookbears and M is shouting, “new shoes!” and holding up each foot in turn as the class leader is desperately trying to continue reading the story to the rest of the group…!). Another habit of M’s, which I think she has in common with most toddlers the world over, is a burning desire to remove her socks at every possible opportunity. Particularly in the car. I now have to build in time to replace socks and shoes when we arrive at our destination! Add B into the mix with her teeny tiny newborn feet that don’t seem to keep a pair of socks on for more than five minutes, and I find myself finding random socks all over the place! Fortunately, the lovely people at Sock Ons have sent us some to try out. I’d seen Sock Ons before but never tried them as I didn’t think they’d work. Well, I was wrong. B has had her Sock Ons all day today and her socks haven’t budged from position at all. I thought M would give them a bit more of a run for their money. 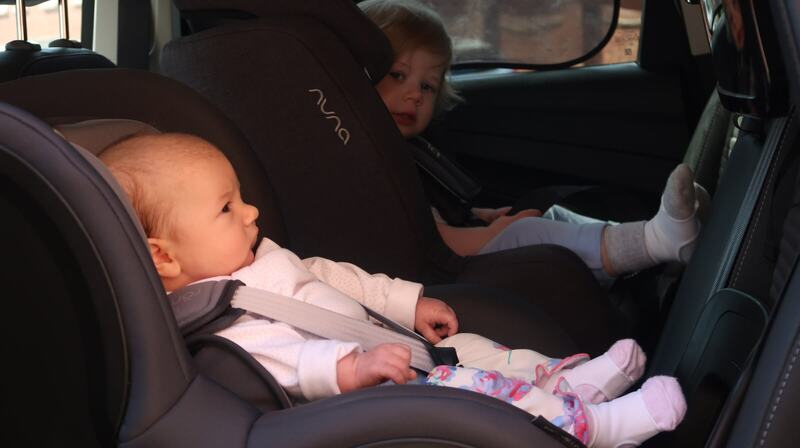 In the above photo, I’d just loaded the girls into the car to go to a toddler class. Usually, M has removed her socks before we’re even two minutes into the journey. M was excited to put her Sock Ons on, as soon as she saw that B had some too. M is really starting to embrace big sisterhood and loves it when she and B have anything that even vaguely matches. However, once we were in the car, she started trying to pull at her socks. Cue me begging her to stop so that I could take a photo! Once I’d finished snapping and we were on our way, though, I told her to go for it! I was genuinely interested to see whether the Socks Ons would work against a determined toddler effort or whether they were only really for preventing socks slipping off newborns’ feet. This successful journey made me keen to try out some Mocc Ons that M had also been sent by Sock Ons. Mocc Ons are slipper socks with a bit of a difference. Rather than just being socks with a bit of a rubberised sole, they’re more like actual moccasins with a built in sock. 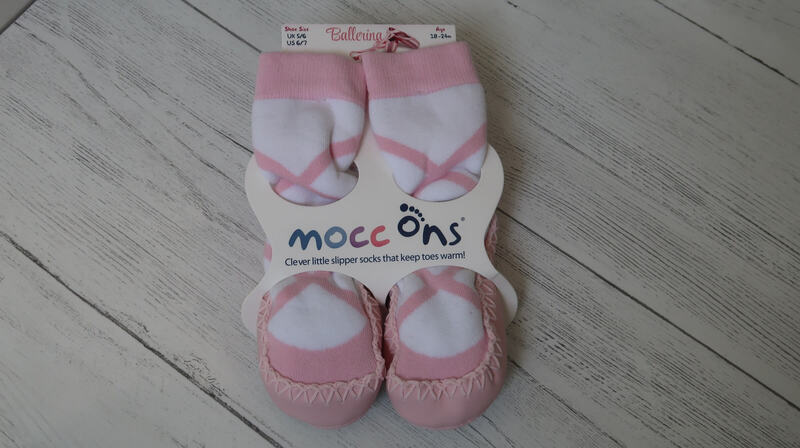 Mocc Ons come in a range of funky styles, but I requested the ballerina design. 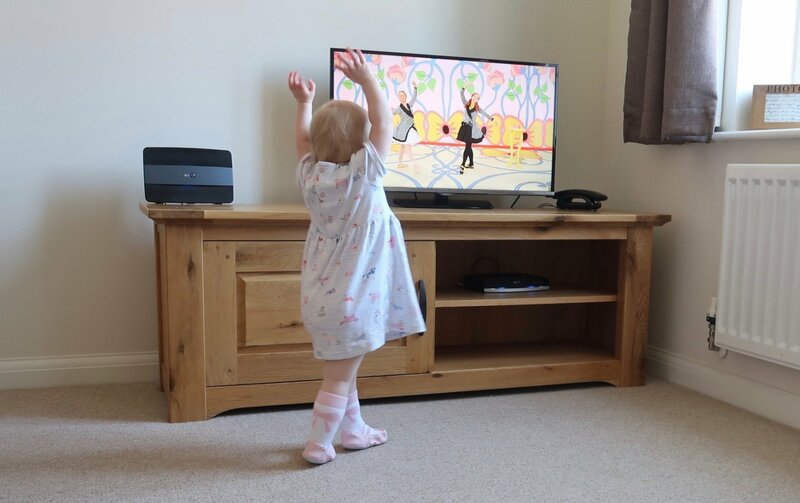 M is obsessed with The Wiggles (you can find it on Netflix) – particularly Emma who is an accomplished ballerina. M loves copying Emma and you can imagine how excited she was to have her very own ‘ballet shoes’ to wear while watching her dance. Disclosure: I was sent these Sock Ons and Mocc Ons free of charge in order to write this review. However, all opinions are my own. "BabyBjörn Baby Carrier One Review"
"Ponderings on Two – Advice from Mummy to my Little Cheeky Monkeys"